With Christmas just around the corner, it is worthwhile to consider creating beautiful decorations or special gifts using the magnificent Amaryllis. Amaryllis are big, bold and very easy to grow. And if you don’t want to take a chance on growing your own, you can purchase the blooms from your local flower shop – they will last for about 2 weeks. Amarylis are truly magnificent – they hold themselves proudly on sturdy stems that are about 18 – 24 inches tall and each stem can produce up to four showy, trumpet-shape blooms and deep red, pink, snow-white or multiple colours. Water well: Allow water to drain through the pot and make sure the water stays below the top of the bulb. Place the pot in a sunny spot: Water sparingly until a flower spike appears. Soil should be moist but never soggy. 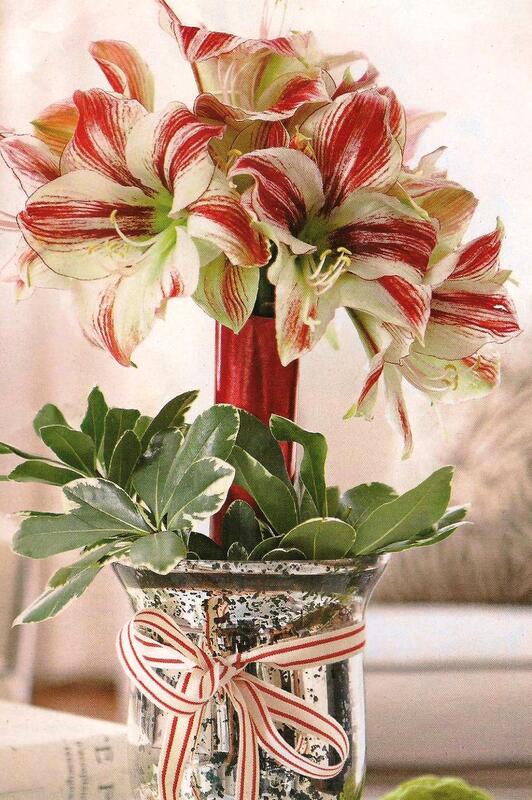 Keep the pot warm: Amaryllis are touchy about cool breezes so you will need to put the pot in a draft-free spot. 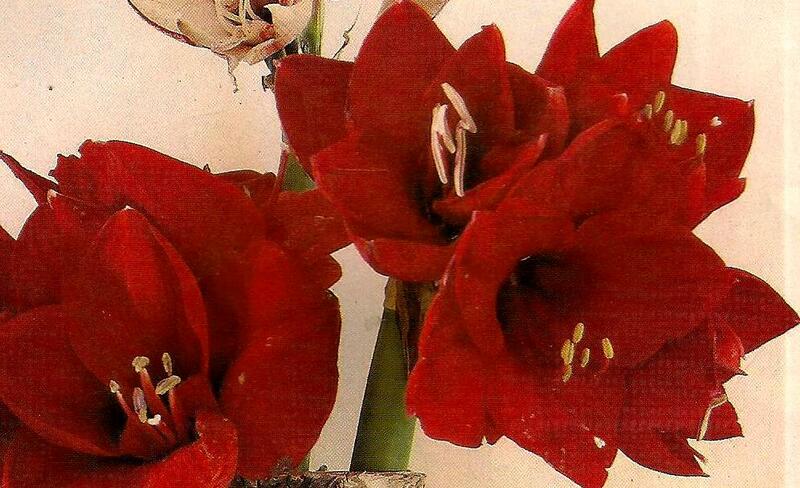 Wait patiently: Most Amaryllis will bloom four to six weeks after planting. Move flowers: Once flowers start to appear, indirect light is best. Snip off flowers as they fade. Cut the stems about an inch for the base after all flowers have bloomed. Strappy leaves grow as the flowering period ends. 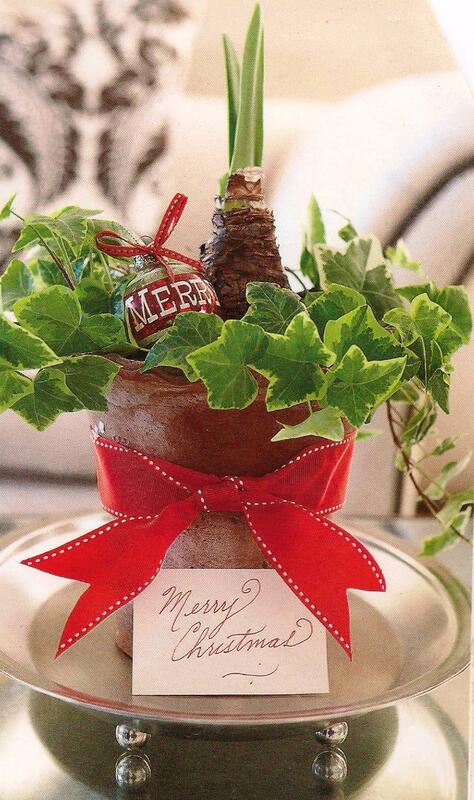 Couple plain containers, pieces of ivy, ribbon and a card -that’s all it will take to create this beautiful hostess gift. 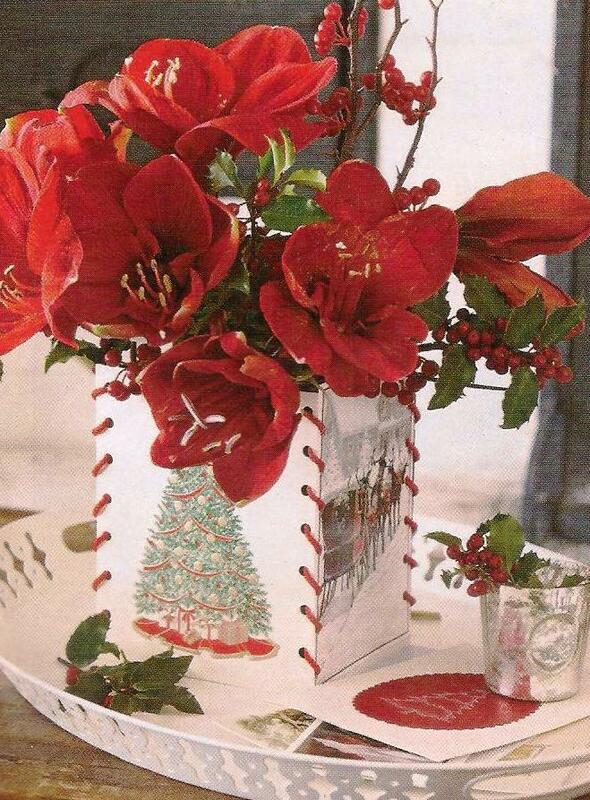 Use old Christmas cards to create an inexpensive and very effective holder – stitch sides together with a thin red ribbon or knitting wool, use florist foam inside and insert blooms you have grown! Great gift or your own dinner table centerpiece. 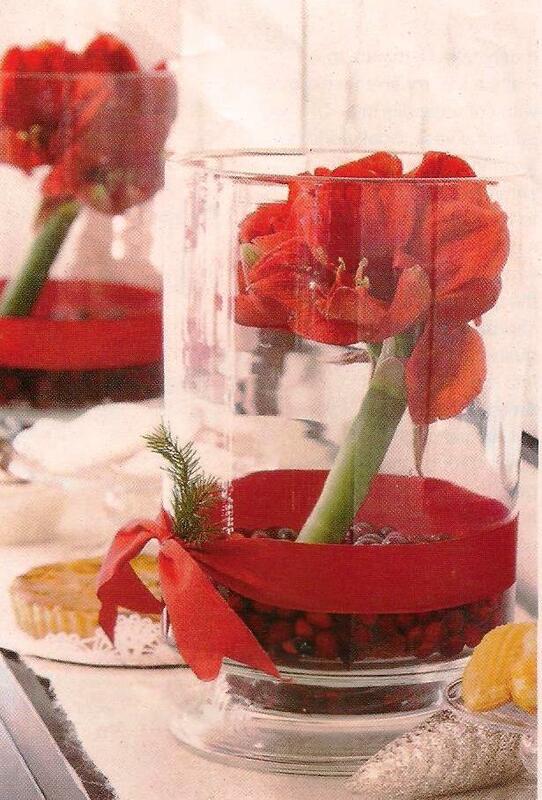 Choose a glass container that will give you the height you prefer, fill with any florist filler, beads or decorative stones (it is a good idea to use a piece of florist foam to secure the stem), tie a festive ribbon around the container – and here you have another hostess gift or a pretty centerpiece. I absolutely love this one! 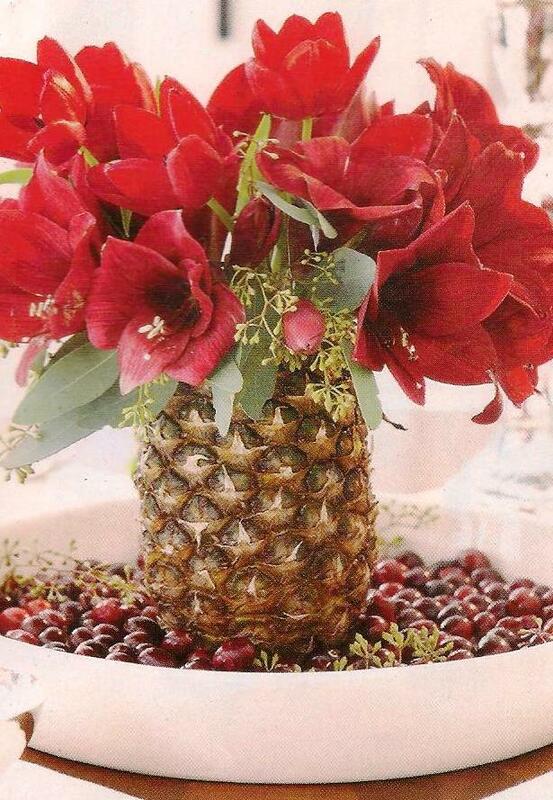 One flat dish, filled with cranberries, one pineapple, carved to allow the insertion of Amaryllis blooms and the addition of little Christmas ornament if you wish – this will definitely be admired, whether you give it as a gift or use it in your Christmas decorations! Absolutely stunning is all I can say about these blooms! And all you have to do is to add a few little holiday decorating touches to the Amaryllis pot and you will have most admired gift or a decorating item! Hope you have enjoyed this information – please send me your comments and pictures as well – your input is always welcomed and very much appreciated!